Gruene has historically been host to travelers and tourist alike, but it wasn’t until the 1970’s when developers created a town with the intention of providing these tourists a place to enjoy the hill country in style. Nowadays, Gruene is home to many fine dining restaurants, shops, and music venues for its visitors to delight in. 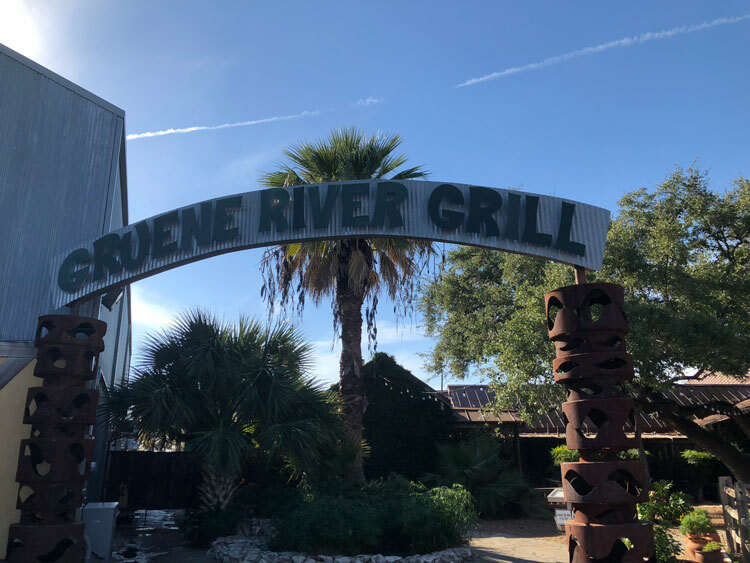 Gruene and it’s surrounding areas offer a wide variety of restaurants with marvelous settings and exquisite cuisine that make dining a pleasure. Situated on a bluff overlooking the Guadalupe River, this spectacular restaurant nestled under the shade of towering oak trees has been the perfect getaway for a unique casual dining experience for thirty years. Check Out Their Menu & More. Just across from Gruene Hall in Gruene Historic District. In a setting of casual rustic elegance where the all-sports TV’s & air conditioning are always on, Mozie’s features a full bar with premium well liquors, select wines & specialty beers and an all day menu of favorite American classics. Mozie’s sliders (those cheesy, juicy mini-burgers) are simply the best around and our 100% all beef hot dog with jalapeno mustard and sauerkraut takes this American staple to a new level. Mozie’s also features sandwiches, salads, the soon to be famous Char-King, South Texas style nachos, a Top Sirloin for the big boys, skinny garlic fries, crispy onion rings and some extra tasty chips, real guacamole and handmade salsa that all slide down extra well with your favorite libation. Check Out Their Menu & More. As the newest addition to the New Braunfels restaurant scene, Infernos Wood Fired Oven & Spirits brings a brand new taste to the city. Along with the fact that they are the only restaurant carrying the legendary Trinidad scorpion pepper, both by itself and infused into their signature sausage, they also follow a staunch commitment to NEVER use frozen products and to ensure that each item, whether it’s a hand toss Pizza, crispy cold salads, or delightful sandwich, are made to order using only the freshest ingredients. Patrons will love enjoying fresh handmade meal in the restaurant’s spacious TV filled dining room, comfortable patio, or from one of the stools lining their full bar. Check Out Their Menu & More. Adobe Verde is located just off the Guadalupe River in historic Gruene, Texas. Its food is prepared fresh daily. All of the ingredients are fresh, and everything from the tortilla soup to the chimichanga is made from scratch. Come on in and join the staff for a delicious meal or award-winning margaritas! Guests enjoy live music Thursday through Sunday and the bands are handpicked with them in mind. Watch the kids play on our outdoor playground, have an ice cold beer and let the music relax you on a Texas night. Check Out Their Menu & More. Cantina del Rio is fashioned after a south Texas ice house. It has a wide range of enchiladas, sizzling fajitas, delicious tacos and specialty Texas burgers. Enjoy a soft drink, ice cold beer or frozen ‘rita on our beautiful deck or in our cozy dining room. Check Out Their Menu & More. Remember a time when the family was brought together by home-cooked meals made from scratch with ingredients fresh from the farm? Find that feeling at the River House in Gruene, with thir exciting menu of classic southern cuisine. Most of the restuarant’s ingredients are locally sourced from Texas farmers, and brought fresh to guests’ tables. Kick back, enjoy a glass of wine and some music on the patio and bask in the southern nostalgia. Check Out Their Menu & More. If guests ask Chef Carol Irwin how she ended up as a Certified Executive Chef, she’ll tell them “It just happened this way.” Lucky for Texas, “it just happened this way” right here. After dabbling in other interests, Carol Irwin enrolled in El Centro College, in Dallas, as a culinary student. Upon graduating, she became an instructor at the school and Certified Executive Chef. 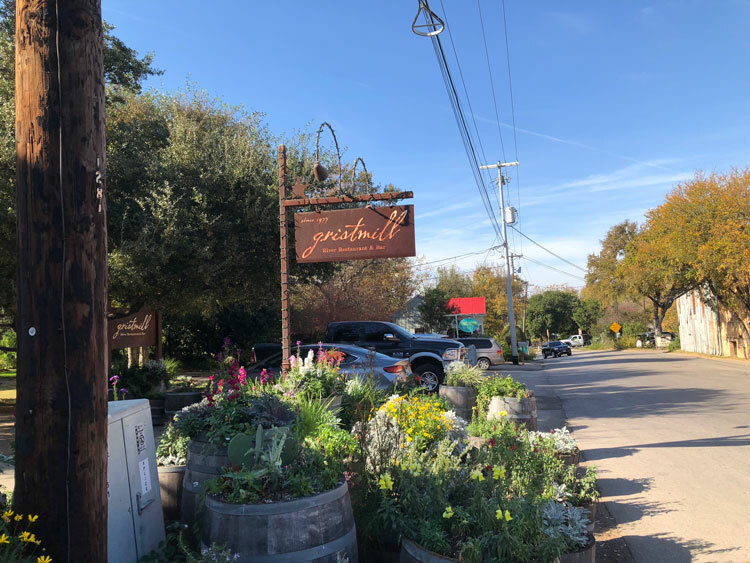 On a family vacation to New Braunfels, she fell in love with Historic Gruene, which is now home of the Buttermilk Cafe. The Buttermilk Cafe is Chef Carol’s take on comfort food with an upscale twist. The aromas and flavors conjure up memories of family feasts, filled with good food prepared by loving hands. C’mon by! El Nopalito Mexican Food Restaurant #1 was started by Guadalupe in 1996 after his son William was born. Before starting his own Texmex Restaurant, Guadalupe got his start in the food industry in Austin, Texas. After moving to New Braunfels, he worked with his aunt in in her restaurant before opening El Nopalito #1. After much success, he opened El Nopalito #2 in 2010 and El Nopalito #3 in 2012. El Nopalito is a family owned business with family running his establishments serving authentic TEX-MEX family recipes. The fresh cookies, pastries, pies and cakes from Naegelin’s Bakery are of historic proportions and timeless quality. It’s all in the preparation. The Granzin family still uses recipes developed by the Naegelin family during more than a century of experimentation to get the right ingredients. As guests walk into the front door of the bakery, the sweet smell of baked foods engulfs you like a warm blanket. The glass cases are full of what seems like an almost endless array of cookies and pastries in a rainbow of colors. The bakery is still famous for their strudels that Naegelin perfected years ago. The Granzin’s have added terrific sausage kolaches in addition to the menu of fruit filled kolaches. The popular favorite: the Lebkuche, a thick, rectangular brown cookie covered with pink frosting. Don’t forget to try the apple strudel! What calls your sweet tooth? American Restaurant – Breakfast & Lunch. German American Bakery. German & Italian Dinner. It’s a combo. Good food starts with good ingredients. At 2tarts Bakery, they are dedicated to making everything from scratch using only the best ingredients to feed patrons’ family, mind, body, and soul. Whether a customer is planning a dream wedding, have an upcoming birthday, or just need to satisfy a sweet tooth, the Tart team is here to help! After years in the restaurant business and undertaking the renovation of several historic homes in New Braunfels, the owners decided to combine their eclectic blend of experiences and try constructing and operating a restaurant of their own. Aside from wanting to establish a creative and comfortable space, they wanted to draw from the diverse cultural and culinary influences of the Texas Hill Country for a fresh, new dining experience. Check it out! Bill Been, along with his wife Jo Anna, fired up the ovens at Myron’s in 2003. Bill, whose first name is actually Myron, spent over 20 years working for several well-known steakhouses perfecting his art before he and Jo Anna decided to venture out on their own. The Been’s first steakhouse was, and still is, housed in a remodeled 1924 movie theater in downtown New Braunfels, Texas. Should guests be called to the restaurant’s office, you’d find yourself in the theater’s projection booth! The New Braunfels location continues to be a resounding success. Bill and Jo Anna’s daughter, Jenny, and husband Steve, have taken over the reins managing the New Braunfels restaurant. Patrons enjoy the restaurant’s intimate booths, ornately stamped tin ceilings, and perfect lighting. In 2011, the Beens decided to make it easier for folks in San Antonio to partake in their wares by opening a second location in Alon Town Centre at the corner of NW Military Highway and Wurzbach Parkway. The new location’s more modern atmosphere is decidedly different as compared to the New Braunfels location – featuring a very large bar with outside seating, a dedicated wine room, and overall “Texas Modern” decor (you’ll have to see it to understand). However, while the Been’s restaurants both have tasteful, inviting ambiance, they are more famous for their steaks, wine and service. Do you love steak? A Tan Sushi Bar’s first location is located in Memphis, Tennessee and has been a success for 20 years. A-tan received its name from the mother of nine children, and now there are five different restaurants in the family all over the United States. The second location, here in New Braunfels, is a combination of contemporary styling with a hint of tradition. It infuses classic Japanese foods with other Asian cuisines to offer a unique dining experience. The third and newest location, in San Marcos, offers up a more traditional style of Japanese fare and a wide assortment of noodle dishes. Whichever location guests visit, the staff and owners hope you enjoy and return soon! Try some sushi. Welcome to the family owned and operated Friesenhaus German Restaurant and Bakery located in the heart of New Braunfels! German family Dirks arrived in 2004 to open the German restaurant Friesenhaus in the former Krause’s Café building. After a long remodeling process, the Friesenhaus finally opened its doors on March 7, 2006. Why call it Friesenhaus? The Dirks family descended from a northern region of Germany bordering the North Sea called “Friesland,” so Friesenhaus means the “House of the Frisians.” This region of Germany is best known for delicious fish specialties such as “Rollmops” and a strong, black “Ostfriesen” hot tea, which is mixed in-house as the “Friesenhaus Original” tea served with Kluntje sugar pieces and heavy cream. German Cuisine. In 1915, William G. McAdoo, then the Secretary of the Treasury, was commissioned to build the city of New Braunfels its first federally built United States Post Office. Once completed, the Post Office quickly became a first-class facility for locals to send and receive mail, conduct financial business in the Treasury Department, and as many have told it, “to catch up on the news and gossip around town.” It has been McAdoos greatest pleasure to restore this beautiful New Braunfels landmark, that was closed to the public for 25 years, back to its grandeur of days gone by. Take a look around and guests will discover many photos of the construction of this building. Looking even closer, they’ll find that many pieces of equipment and machinery from the original Post Office have been reused to decorate McAdoo’s Seafood Company. Come join the staff and “we hope McAdoo’s Seafood Company fits your expectations to the… letter.” Seafood lovers, Enjoy! It’s BBQ. What else is there to be said. Good food starts with good ingredients. At 2tarts Bakery, they are dedicated to making everything from scratch using only the best ingredients to feed guests’ family, mind, body, and soul. Whether a customer is planning a dream wedding, have an upcoming birthday, or just need to satisfy a sweet tooth, the Tart team is here to help! The fresh cookies, pastries, pies and cakes from Naegelin’s Bakery are of historic proportions and timeless quality. It’s all in the preparation. The Granzin family still uses recipes developed by the Naegelin family during more than a century of experimentation to get the right ingredients. As patrons walk into the front door of the bakery, the sweet smell of baked foods engulfs them like a warm blanket. The glass cases are full of what seems like an almost endless array of cookies and pastries in a rainbow of colors. The bakery is still famous for their strudels that Naegelin perfected years ago. The Granzin’s have added terrific sausage kolaches in addition to the menu of fruit filled kolaches. The popular favorite: the Lebkuche, a thick, rectangular brown cookie covered with pink frosting. Don’t forget to try the apple strudel! What calls your sweet tooth? A casual atmosphere which offers an ideal place to eat, drink, hang out, or study. 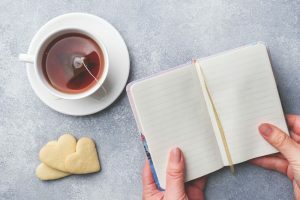 Crosswalk Café has two different locations, Downtown New Braunfels & at Westpointe Shopping Center, which serve coffee beverages, baked goods, and sandwiches. On The Grind is here to revolutionize the way you enjoy guests’ favorite coffee, smoothie or energy beverage. Long gone are the days of fighting for a parking spot only to stand in line to be served by a barista who is quite often far from excited to see you and ensure a customer gets an amazing cup of coffee. Bakers start work before the sun rises each day to ensure that every batch is as fresh as possible before it gets to the customer. The warm smell of baking often escapes onto the street before the shop is even open. Breakfast & Sweets. 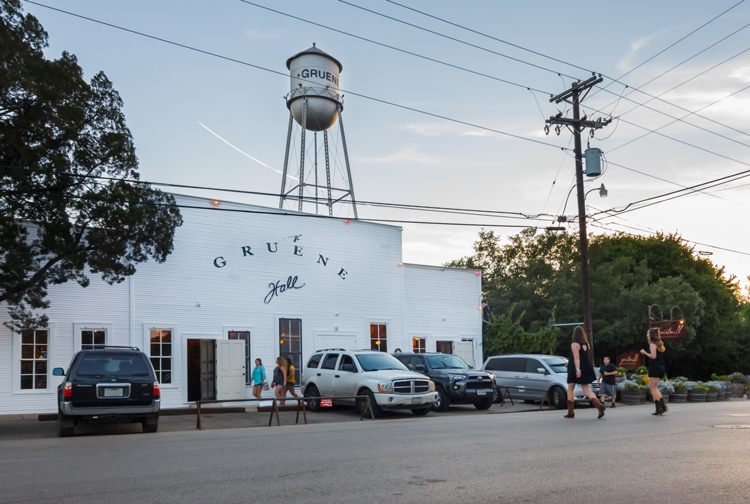 Gruene and it’s surrounding areas are prime locations for shoppers. 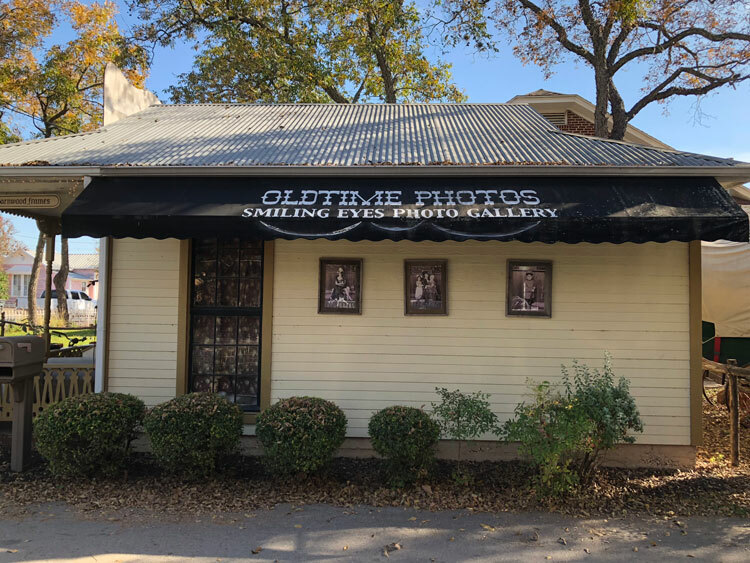 With over 30 stores in Gruene alone, there is plenty browsing to do and with the factory outlet malls just 20 minutes away you can find something for everyone. Located just across from Gruene Hall, Gruene Antique Company offers 6,500 sq. ft. of antiques, collectibles, gifts and decor in a stunning Texas Landmark Building. In business since 1986, this large antique mall is a popular destination for antiquers and browsers alike. The building was built in 1903 by Henry D. Gruene as a place where tenant farmers could buy their wares and do business. Today, Gruene Antique Company encompasses the large center room of the building which once held the dry goods for sale, and the east wing which houses Gruene’s original bank vault. We invite you to visit us here in Gruene Historic District. 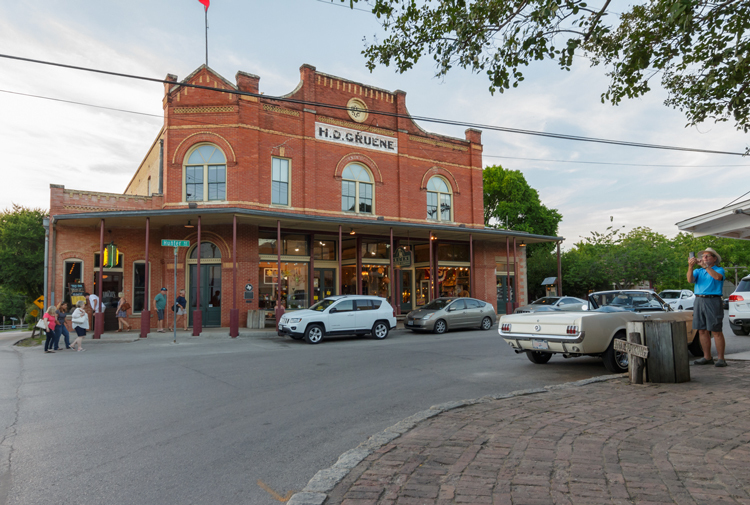 Shop the Gruene Antique Company and the 25+ other shops located here, grab a bite at Mozie’s or the Gristmill, then head over to Gruene Hall for one of their nightly shows! Explore Gruene Antique Company. Boerne, Texas Carousel Antiques & Fickle Pickles was founded in 1987 by Billie A. Shaw. The Antiques soon became a backdrop to Mrs. Shaw’s Fickle Pickles®. Locals and day-trippers from the surrounding Texas Hill Country lovingly dubbed Mrs. Shaw “The Pickle Lady.” Devoted to producing a high quality product, The Pickle Lady did it all! As the word spread, The Pickle Lady started shipping those delectable Fickle Pickles to folks that just could not get enough of that “Sweet, Crunchy, Spicy” taste! Early 2004, The Pickle Lady retired and her daughter and son-in-law took over production of those delicious Fickle Pickles. Lisa Armstrong Obriotti soon became known as “The Pickle Lady’s Daughter” making and shipping Fickle Pickles all over the world. Fickle Pickles are regularly shipped as far north as Alaska and to our troops in Iraq. Summer 2006, a second store was opened in the quaint town of Gruene, Texas and in 2014, the 3rd store opened in Bandera, Texas. Learn More About Fickle Pickles Antiques & Pickles. Located in the historic Hampe House, we sell antiques and things unique! Old World Antiques and Collectibles shipped directly from England and Europe. Furniture, porcelain, stoneware, copper, bottles, books, Verbena Soap Company – soaps, salts, bath and body care products, Music of the Spheres windchimes, Rocky Mountain Rustic Ducks, and more. Explore Black Swan Antiques. When Centuries Past owner Carol Gould was decorating her first few homes she leaned toward “trendy” and ended up with a hodgepodge of furniture that never really meshed. Then one evening she and her husband went to a true antique auction in New Orleans and that was it! The workmanship, style, and beauty of true antique pieces made her see the error of her ways.When she retired and returned to her hometown of New Braunfels in 2010 she decided to open a small antique shop of her own — Centuries Past Antiques and Gifts in New Braunfels, Texas — with the goal of providing beautiful but functional antique furniture and accessories for the stylish homes and vacation get-a-ways of today. Carol hand-selects each piece for style and to ensure a variety of price points. Come visit and see what’s new in the store today! Artistic Impressions LLC is a decorative concrete remodeling company serving San Antonio, Boerne, New Braunfels and South Central Texas. They specialize in: garage makeovers, decorative concrete staining, stain concrete, stenciling, scoring, concrete and epoxy coatings as well as rock engraving for those personalized garden stones, markers, or cherished gifts. Artistic Impressions LLC has been certified by Engrave -A-Crete, industry artistic concrete tooling pioneers; Kemiko, industry acid staining pioneers; Arizona Polymer Flooring, garage coatings and concrete floor coatings specialists; and the list goes on. Artistic Impression LLC continues to strive to keep up with technology and the ever-changing applications of decorative concrete to bring valued customer, the professional experience. They proudly attend the World of Concrete on a yearly basis. Read more. Full of History this 1900’s Victorian Style Home, was built by the founder for his daughter Ella Gruene as a wedding gift. Customers will enjoy a unique shopping experience as they stroll through each of the 7 rooms that are individually themed. Truly something for everyone can be found. Here you will delight your senses. See: New trends and one of a kind special gifts. Touch: Exquisite handcrafted pieces. Hear: Sounds of nature in the garden room along with music to enhance the shopping experience as customers flow from room to room. Smell: Aromas of coffee and candles. Taste: delicious dips, jams, jellies, and spreads. Sip freshly ground and brewed specialty coffees and seasonal Wassail, a local award-winning favorite. Explore Dancing Bear & Gruene Gardens. To see what’s hot in fabulous fun fashions traveler certainly want to visit Gruene With Envy located in Historic Gruene, Texas just up the street from the iconic Gruene Hall. They have 18 years of experience outfitting ladies from around the world in fun fabulous fashions! Gruene With Envy carries Jack Rogers shoes, great jewelry, and fun unique apparel! Learn More. Gruene was settled in the late 1800’s by German cotton farmers. The economic hardships of boll weevil infestations in the 1920’s and the Great Depression in the 1930’s led to the downfall of the family farming business and Gruene became a virtual ghost town. In the 1970’s, the land and buildings were purchased by a San Antonio resident, restored and reopened. Check Out Their Selection. Texas Homegrown is a must stop in Visitors “Gruene Experience.” They carry a unique blend of vintage-look and trendy ladies clothing, jewelry, and accessories. Pretty Angel’s vintage line is a versatile look for boot stomping, dress-up, and fun. Skirts and tops in flattering styles from ANU, Etc and Scared Treads are colorful and abundant. Check It Out. Alibi Boutique opened its doors to the citizens of New Braunfels, Texas in 2008 with the hopes of becoming the primary fashion forward boutique for the surrounding area. One of the many qualities that makes Alibi stand apart from other stores is our continuous commitment to our customers. Making Customers feel and look fabulous is their number one priority! They do this by offering a variety of unique lines and products that are known that the shoppers enjoy. Explore The Store. Everyone is the author of their own story and this is ours. Once upon a time, a man named, Bill, and a woman named, Monique, fell in love and got married. They had three children who were absolutely wonderful in every way. From their funny antics to their awful tantrums, they were perfect. Bill and Monique’s children were named Lilly, Dash and Violet. All of them loved to read but, the youngest, Violet loved it the most. She had a lovely little purple chair that she would sit in to look at all of her books. She pretended to read her books by making sounds and movements, pointing to pictures of dinosaurs, princesses, and animals, especially dogs. One beautiful, sunny day, Violet had a terrible, horrible accident and the reading stopped that day. On a day just like any other, while walking through the wonderful, amazing little town of New Braunfels, Bill and Monique decided it was time to give back to the community that gave them so much love. They decided right then, that the reading needed to begin again and that is how The Purple Chair came to be. Learn more. Since the inception of the Got Toys store in Gruene in 2009, to the opening of our second store in beautiful downtown New Braunfels in 2012, we here at Got Toys have strived to find unique toys and gifts that put a smile on everyone’s face! We carry a large line of books and retro toys, such as wind-up tin robots and retro games, Spirographs, Lite Brights, and even Strawberry Shortcake and Monchichi! Every day we hear from our customers, “This really takes me back to my childhood!” We also carry a huge selection of wooden toys and hard to find items for kids of all ages! And did we mention that we carry gifts for adults, too? We have a large variety of funny mugs and socks, electronic gadgets and accessories that are sure to please that hard-to-buy-for person in your family. And you wanna know the best part? We gift wrap. And it’s free. Why? Because we like you. And not in the weird creepy way….more like in the friendly Mr. Rogers way. Come see us! Explore Got Toys. Gruene General Store has a historic setting and ambiance of yesteryear, Gruene General Store ranks as one of the top 40 places to visit in Texas. For those who cannot drop by, they have assembled a few of their special items for shoppers enjoyment. For those who have been in the store, they want Customers to know that anything in the store that is available for purchase can also be shipped. Explore The General Store. T-shirts & COLUMBIA sportswear. Texas gifts & souvenirs. Gruene memorabilia. Hunter Junction. Stones and Bones is owned by John and Susan Mellyn of Historic Gruene, Texas. They have been in the artifact business for over 20 years and collecting most of their lives. This website is part of the evolution of their business. Some of their personal artifacts are pictured in Lar Hothem’s books (Paleo-Indian Artifacts, Shell Bone and Antler Artifacts, Unusual Artifacts, and Who’s Who’s #10). Take a youngster arrowhead/fossil/mineral hunting. You might inspire a child to become interested in Archeology, Paleontology, or Geology. Hip Boutique with a great style! Large selection of Consuela, Sbicca Footwear, Yellow Box Shoes, Grazie Footwear, Home Decor, Jewelry, Children’s Apparel & Gifts! Brands such as Free People, Tru Luxe, Vava, PPLA, Joy Joy, Tribal, Escapada, and much more! Come visit our MAN CAVE! The new Tipsy Gypsy in Historic Gruene, Texas is the destination for bohemian chic clothing, accessories and home accents. Steeped in Gruene’s rustic atmosphere, you’ll find a great collection of Texas and Gruene-themed gifts, souvenirs and of course, T-shirts! Lucky Ewe Yarn is a full-line yarn shop located in New Braunfels, TX, near historic Gruene. They offer an eclectic range of yarn, fiber, and tools for knitting, crocheting, weaving, and spinning and pride ourselves on our expansive collection of yarn created by local artists. Take a look. Kay’s Kottage carries a variety of wonderful lines: Oh Sew Happy, Kivelli Baby, Unipak, Lindsay Philips SwitchFlops, both adult and children; MudPies baby clothing and ladies, PJs, swimsuit coverups, tunics, and bags; MonkeyToes children shoes; S.T.A.M.P.S watches made by the Swatch company out of Germany; Bottoms Up wine glasses; Baby’s first jewelry (lead free, sterling silver and pewter, and much, much more! Coming soon, Vegan Handbags by Shirleah! Trendy Fashions, Unique Gifts. Hip Dingo. Located in New Braunfels, Texas at the Gruene Lake Village, The Republic Cigar Humidor and Lounge is the place to be where the customer can relish the fine art of smoking. Whether sitting out on their patio or inside the store, purchase and enjoy a wide variety of tobacco products and accessories. They carry the full line of The Art of Shaving which includes products to help the customer achieve the perfect shave. Membership to The Republic Cigars private lounge is available and offers a more luxurious atmosphere with choice amenities as well as a state of the art audio and visual system. Learn More. The Great Texas Pecan Candy Co. offer nine different flavors of pecan candies, all made in their Katy location. Be sure to visit the store in Gruene seven days a week. Special order desserts may be ordered at the Katy location. Explore Their Candy Selection. The Texas Hill Country has become a prominent region for wine enthusiast within the last few decades and continues to make a name for itself. There are several wineries located here in Gruene, as well as in our neighboring communities. Here are a few local places to enjoy a glass of your favorite wine. Originally designed as a winery, Villa at Gruene is the premier wedding and event venue in New Braunfels. The relaxed, Tuscan country-themed event facility sits on an acre of land and provides over 6,000 sqft of event space. Villa is perfect for a hill country weddings, rehearsal dinners, corporate team-building and seminars, pre-event parties, charity and civic events, and unique social gatherings. The venue’s spaces are designed to impress and the grounds are beautifully landscaped with grapevines and other native Texas plants. Villa is located in the historic Gruene district of beautiful New Braunfels, Texas, deep in the heart of the Texas Hill country. Founded in the 1840’s by German settlers, Gruene is overflowing with old world heritage and small town charm. 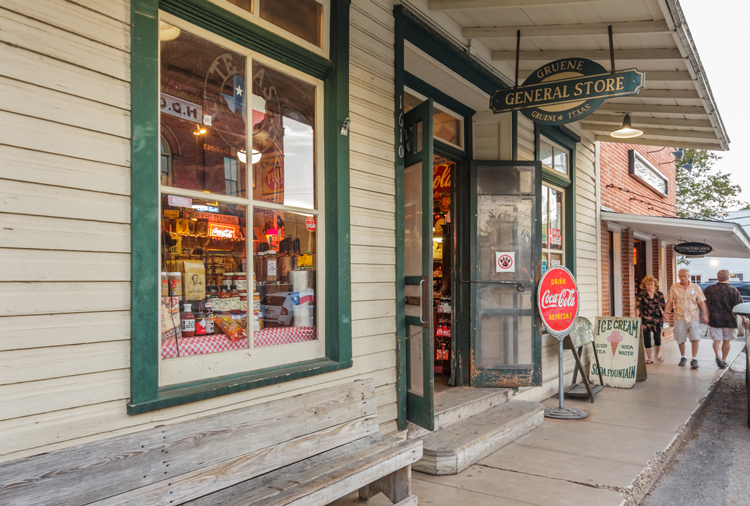 Recognized by the Texas travel industry as a premiere attraction for visitors, Gruene and the greater New Braunfels area offers museums, historic districts, shopping, dancing, live music, water parks and river rafting and tubing. Find Out More. 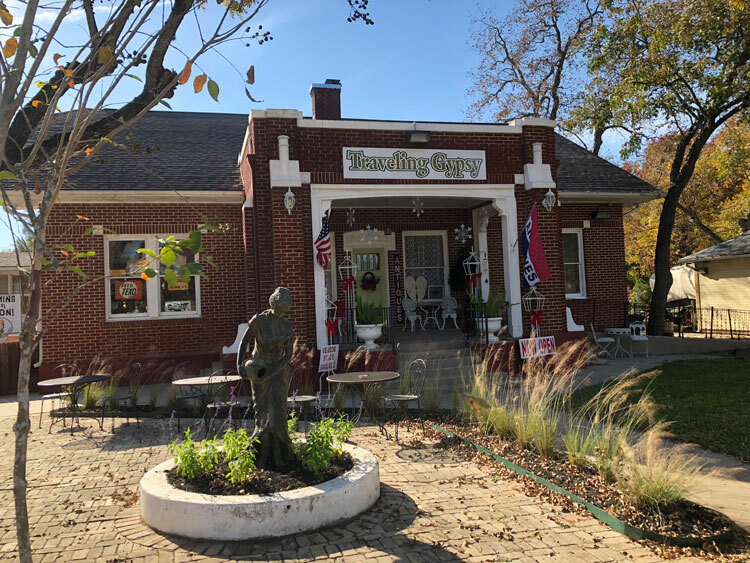 The Grapevine is a tasting room and bar located in Gruene Historic District featuring one of the largest selections of Texas wines available, as well as Texas craft beers and select wines from around the world. Step up to the bar to enjoy complimentary tastings daily. They sell wine by the glass or bottle with discounts on wine by the case. Their craft beers on tap can be purchased by the pint or growler with discounts on growler refills. In addition, the Grapevine offers cheese and sausage plates, as well as wine accessories and decor. Relax with a favorite wine or beer in the cozy store, on the scenic front porch or in the outdoor garden and patio. Find Out More. Oak Valley Vineyard was voted Texas’ Most Romantic Winery of 2014 by Official Best of Texas, as seen on Discovery. Come in to experience a Texas bistro with rustic elegance. Oak Valley Vineyard offers fine dining at a San Antonio, TX location that is perfect for a romantic dinner, private party and much more. If you are looking for a steakhouse or are searching “restaurant nearby” on your smart phone, you need look no further than Oak Valley Vineyards. Whether you are looking for an elegant night out or you want to book your next big event, they will provide you with the delicious cuisine and superior customer service you deserve. Find Out More. After years in the restaurant business and undertaking the renovation of several historic homes in New Braunfels, the owners decided to combine their eclectic blend of experiences and try constructing and operating a restaurant of their own. Aside from wanting to establish a creative and comfortable space, they wanted to draw from the diverse cultural and culinary influences of the Texas Hill Country for a fresh, new dining experience. Find Out More. Gruene Hall, built in 1878, is Texas’ oldest continually operating and most famous dance hall. By design, not much has physically changed since the Hall was first built. The 6,000 square foot dance hall with a high pitched tin roof still has the original layout with side flaps for open air dancing, a bar in the front, a small lighted stage in the back and a huge outdoor garden. Advertisement signs from the 1930s and 40s still hang in the old hall and around the stage. In the 1800s, Gruene Hall held weekly dances and played host to everything from traveling salesmen to high school graduations to badger fights. 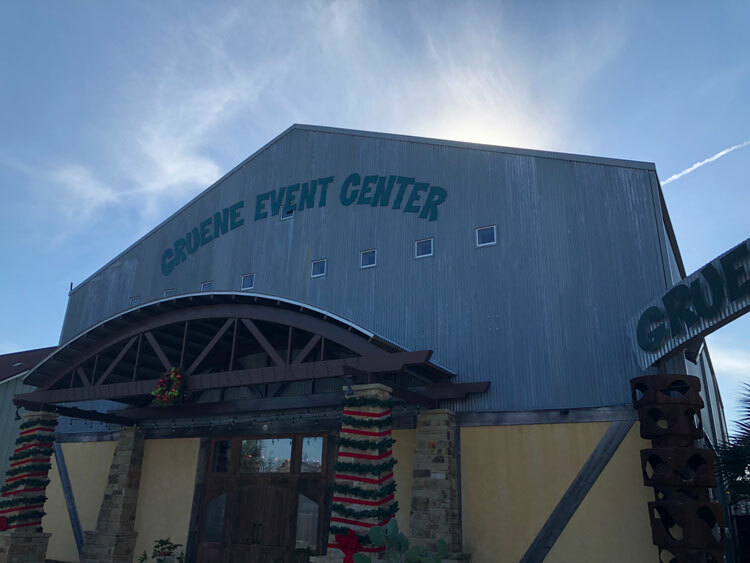 Today, the Hall has continued to be a center for the Gruene and Central Texas social and entertainment scene, and the activities are just as varied. In any given week, locals hold court in the front bar after work talking over their day’s activities, a friend’s passing, the weather or the state of the economy. Possibly at the same time, the filming of a movie or commercial or preparation for a festival, fundraiser or a major corporation’s private party may be taking place in the main hall or beer garden. Martini bar with over 25 delicious martinis, plus a full bar and a small selection of wine and bottled beer. Great place to hang out with some friends. Located in a 1940’s era pole barn that originally was used to house sheep and hogs, Tavern in the Gruene is unique Texas hangout situated less than a mile from the Gruene Historic District right next to Gruene Homestead Inn. “The Tavern” is a Live music venue. Originally established in 1871, The Phoenix Saloon was the first bar in Texas to serve women. It had a beer garden with a bell in a tree for service… as it would besmirch a lady’s reputation to enter the bar. There was an alligator pit and badger fights, live music on Saturday nights, and a parrot on a perch inside the front door taught to say “Have you paid your bill! ?” in German. In 1894, proprietor of the back room cafe, William Gebhardt, invented chili powder, devising the first process to crush and dry fresh chilis. Prohibition closed the Phoenix Saloon in 1918, though for a couple more years the basement served as an illicit brewery, with tunnels cut to run the drink out under the streets of downtown. In 1922, the building was expanded into its present configuration. Turned into a department store, with a refrigerated water fountain that was always proudly nonracial and unsegregated, it remained little changed into the 1990s. In March 2010 after 2 years of bruising renovation, the Phoenix rose again as an historic Texas bar, chili parlor and live music venue. The Oyster Bar opened in October 2003 and is located in downtown New Braunfels. In May of 2014 a full kitchen was added to offer guests a wide variety of bar fare. Under the new ownership of Dave and Christina Cinotto, and partner Nathan Vosper, The Oyster Bar has been revitalized into a full service sit down bar and grill that offers exceptional service, scratch made fare, and hand crafted drinks. Downtown New Braunfels is a great place for tourists and locals alike and they are excited and proud to share their extensive experience in this industry with our guests. Moonshine & Ale in downtown New Braunfels boasts a large indoor bar with one of the most exciting Rock & Roll Sing Alone Piano Bar Shows in Texas on Friday and Saturday and Live Band Karaoke on Thursday nights! We have a full bar, 150 different beers and a spinning shot wheel. Moonshine & Ale also has a brand new outdoor patio with it’s own bar. Scores has been in business since 2004 and is the best place in town to come relax, enjoy some great food and visit with friends. You will not find a bad seat in the house to watch your favorite sporting event. Scores has 2 large projection screen TV’s along with a view of numerous TV’s from any seat. Come to Scores and enjoy something from our menu that is sure to satisfy your hunger or for a quick snack. They have a large variety of specialty beers to choose from along with the top brands of liquor for you to choose from. While at Scores you can enjoy the Touch Tunes Internet Juke Box, 2 Pool Tables, 2 Dart Boards, and the latest version of Golden Tee. You might even catch some of New Braunfels local talented musicians playing on the stage. If you are wanting to catch the game, grab something to eat, or just relax with some friends come and see us at Scores Sports Bar & Grill. The Watering Hole Saloon is a classic. “THE HOLE” has provided a place in New Braunfels with great music, plenty of sports, a variety of fun bar games plus many, many great people since 1986. What’s kept its long-lasting appeal must be its “something for everyone” attitude. No one knew what Bob visualized when he purchased the 600 square-foot icehouse and turned it into the 4000 square foot dance hall it is today. The heart of The Watering Hole is its hand carved bar crafted by chainsaw artist Terry Boquist. This unique work depicts local high school mascots, the New Braunfels Unicorn and the Canyon Cougar, along with Texas cowboys and longhorns and unusual tubers floating the Guadalupe and Comal Rivers. Grab yourself 1 of our 50 different cold beers or a refreshing cocktail as you admire all the works of art plus many of your favorite athletes and entertainers that have a spot of their own displayed on the walls. The many different memorabilia will keep you busy for hours. Even the ceilings are full of eclectic nostalgia that will have you wondering what it is and when it was used. Each visit you make will provide you with a new find. They boast a smoke-free friendly atmosphere and a huge selection of drinks to choose from. Check out their up-coming events below or rate the different beers on their beer list. Live Music Venue, Open-Air Non-Smoky Environment, Huge Patio, Full Bar, Cold Drinks, Hot Food, Great Beer Selection, and Lots of Live Music! Billy’s icehouse. Come see New Owners, New Mgmt! Same Great Music, Same Beautiful Property! River Road Icehouse. A hometown brewery producing classic German and English styles with an American twist. They feature year-round selections, seasonal varieties, and small batch creations. Fraust Brewing Company. With an indoor and outdoor bar, daily happy hour and drink specials, and live music 7 nights a week, it’s no wonder the Pour Haus was voted the Best Bar in New Braunfels. Located in the heart of Historic Downtown, you can find locals playing washers and giant Jenga while enjoying drinks from an impressive craft beer & signature cocktail menu. The Pour Haus. Taking advantage of its convenient New Braunfels location, just minutes from hotspots like Gruene Hall and less than a mile from River Road, the Whitewater Amphitheatre is well integrated into the community and its existing riverside landscape, the ONLY venue bordered on two sides by a “year round” creek. The venue has taken great care to retain the beauty of its natural surroundings, canopied by a silhouette of ancient Cypress and large heritage trees. The Whitewater Amphitheatre incorporates distinctive architectural elements into an already gorgeous riverside location. There is an abundance of attractions for the visitors of Gruene and it’s surrounding area, including water recreation, golf, and other such things like. Rockin ‘R’ River Rides is the one stop shop for all an enthusiast’s tubbing, rafting, kayaking, paddle boarding and equipment needs for New Braunfels, Texas. The only outfitter on both the Guadalupe and Comal river and voted Best Outfitter for 18 years running. Rockin ‘R’ River Rides has been doing business in New Braunfels for 37 years. Two guys who had a dream back in 1979 made it come true, and patrons all thank them from the bottom of their hearts. What started with 50 tubes, 2 lawn chairs, their personal pick-ups and a small patch of ground has grown beyond their wildest dreams. It hasn’t always been easy depending on Mother Nature to put food on the tables, but somehow they’ve made it work through droughts and devastating floods. It must be destiny, well go figure with the last name “Rivers.” Showing folks a good time in a piece of Texas heaven is what it’s all about to these guys. Come experience what put a twinkle in their eyes all those years ago! The Guadalupe River’s crystal clear water is one of the most beautiful stretches of Texas. Storytelling, swimming, and yes, an occasional water fight is an unforgettable experience. Float trips are variable due to the fluctuations in release rates from Canyon Dam, but there are usually trips from 2 1/2 to 8 hours available. Paddlers can travel at their own pace. Check out the latest current river conditions, Inflatable kayaks and tubes are also available for rent. Gruene River Company professional staff will assist you to make your trip with Gruene River Company a pleasant and enjoyable one. Kick back in a tube, raft, or inflatable kayak, for a relaxing, or an exciting trip (which includes Huaco Falls, the largest on the Guadalupe River). Wear swimwear, tennis shoes and bring sun protection. 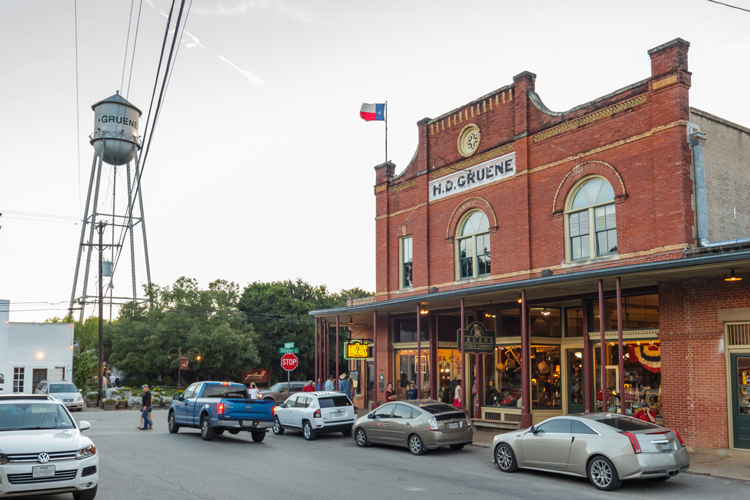 Located within the city limits of New Braunfels, TX, Gruene (pronounced “green”) is a historic district along the Guadalupe River. It was once a thriving, cotton-producing town, hosting folks passing through between San Antonio and Austin and is now host to tourist from around the world. If travelers are anyone from a college student to a history buff or if they just like to do a bit of wine tasting and dancing, Gruene has something for them! Old Time Photos. Schlitterbahn has been the ticket to summer fun for over 35 years. The first family of water parks has become an integrated part of South Texas summer, and grew to include Kansas City, Kansas in 2010. Schlitterbahn has five unique water park destinations. At every Schlitterbahn you will find tubing rivers, uphill water coasters, Boogie Bahn surfing rides, Torrent Tidal Wave Rivers and picnic areas with shade. If you are looking for a great place for tubing in New Braunfels, TX or anywhere in the central Texas area, this is the place to be. Come one, come all and have a great time on the Crystal Clear Waters of the Comal River. Most people hear about the Guadalupe River and unfortunately do not get the opportunity to experience the beauty of the Comal River. We are located right on the shoreline of the Comal River… Texas Tubes. Like on the Discovery Tour, where you’ll see massive, otherworldly formations formed by single drops of water and the slow passage of time. Or, explore the Hidden Passages Tour, where shadows dance over delicate formations and mystery awaits in every shadow. Take to the skies high above Texas, as you ascend the Canopy Challenge, or for a true test, try tackling one of the adventure tours. Experience a sense of discovery finding your way through our AMAZEn’ Ranch Roundup, a 5,000-square foot outdoor maze. And if you want some good old-fashioned fun, look no further than the Mining Company, where you mine and pan for gems, fossils and other treasures. Whether you are a first-time visitor, an avid caver or someone in between, Natural Bridge Caverns awaits with a once in a lifetime experience you’ll never forget. After your adventures, check out the new Shops of Discovery Village. Indulge yourself at Big Daddy’s Sweets, Treats and Brew, an old-fashioned parlor and general store. And shop for amazing gifts, jewelry and souvenirs in the Discovery Village Trading Post. Natural Bridge Wildlife Ranch has taken to heart the care of animals from all over the world for over 30 years. With over 450-acres of natural, scenic, protected environment where animal populations thrive, Natural Bridge Wildlife Ranch takes pride in showcasing and sharing with you amazing creatures from all over the world. The safari trek covers miles of the scenic Texas Hill Country and takes visitors about an hour to an hour-and-a-half to drive through once, multiple treks are encouraged as every trip through the ranch is a different adventure. One part education, one part preservation; mixing it up for a day full of fun and adventure. For half a century, the “Snake Farm” has been one the most prominent must-see attractions in the San Antonio/Austin area. Its establishment in 1967 provided a home to an extensive collection of snakes, reptiles and other exotic mammals. With its historic roots and loyal fan base, the “Snake Farm” quickly became an popular roadside attraction that both locals and travelers were drawn to. In 2007, the facility received new ownership and big plans. The Snake Farm has since transitioned to Animal World & Snake Farm Zoo— a fully accredited zoological park that homes over 500 different species of animals. Over the past few years, most of the original Snake Farm exhibits have been restored, renovated and rebuilt. Exhibits have massively increased in size, giving the animals a happier, healthier lifestyle. With hearty enrichment programs and a dedicated staff of zoologists, animal care has exceeded even the highest standards. Discover a world of art and creativity, science and technology, culture, health and history. Welcome to the McKenna Children’s Museum, a collection of educational exhibits designed to stimulate learning and encourage imagination. McKenna developed this unique and magical hands-on environment to provide the tools that help nurture your child’s overall well-being. Children explore in a safe and secure space while parents share the magic of learning. Exhibits include areas of science and technology, healthy eating habits, art and culture, gardening, and so much more. There’s no better place than the McKenna Children’s Museum to let imaginations run wild. Take the journey with Prince Carl and his group of German colonists as they cross the ocean and make their way into central Texas. Admire their courage and determination to establish a new colony at the edge of Indian Territory. Exhibits, rich in local artifacts, photographic images, maps and documents, take visitors through the history and cultural heritage of New Braunfels and Comal County. The Sophienburg Museum offers public lectures, school programs and community events that promote the area’s unique history. SophieNBurg. Join us for a unique annual celebration rich in German culture and full of Texas fun! Located near the headwaters of the beautiful Comal River in New Braunfels, Texas! Here you’ll enjoy good food, music, dancing, exciting carnival rides and games, German, Texan and domestic beer, special events and the finest in Alpine and Bavarian Style Entertainment. It all happens at Wurstfest! The best ten days in sausage history. Cold beer, hot movies, and delicious snacks and meals; the Alamo Drafthouse is dinner, drinks, movies and events, all under one roof. Alamo’s attention to detail in film presentation and programming has made them a second home to movie fans all over the planet and earned accolades from the likes of Entertainment Weekly (#1 theater in America), Wired.com (Coolest Movie Theater in the World) and Fandango.com (One of the Best Theaters in the Country). They have zero tolerance for talking or cell phone use of any kind during movies, and they aren’t afraid to kick anyone rude enough to start texting their friends during a show right out of the theater. They also hate it when other movie theaters make you watch advertisements after you’ve already paid to see the movie, so they’re vigilant about never letting ads hit their screens – they’ve even turned down PSAs for great causes because they don’t want ANYTHING to disrupt your experience of the show. Instead of ads or mind-numbing content named after the number of minutes you have to sit through it if you get to the theater early, they create custom preshows with content themed to most of the features we program. Want to throw parties for a living? Do you want to bring a smile to a kids face every day? The Jumpy Place is now offering franchises! The Jumpy Place is an indoor bounce house facility for children 10 and under where kids and let their imagination run wild all in a clean, safe environment. Oh… and they have free coffee, Wi-Fi, magazines for moms/dads and their signature “Red” couches! Texas Ski Ranch is a 70-acre action sports paradise located in New Braunfels, TX. When it comes to wakeboarding and cable parks, TSR is consistently ranked as one of the top facilities in the world. With three cable systems and a boat lake there is truly something for all levels of water sports enthusiasts. First time riders can take advantage of their incredible coaching and beginner cables. More advanced riders can charge the park and hit structures. Welcome to Wonder World Park, a one-of-a-kind Theme Park, known as the 1st show cave in Texas. Visitors have enjoyed touring the Balcones Fault Line Cave for over 105 years, and now, the park has many other attractions for family fun and entertainment. Enjoy a guided tour and discover the nation’s only true example of an EARTHQUAKE-FORMED CAVE. Go deep underground and see up close the devastation of a major quake. Exit by the “Stratavator” and ride high into the sky to the TEJAS OBSERVATION TOWER. Be amazed by the Topsy-Turvy World of the ANTI-GRAVITY HOUSE where everything is backwards, even water flows up hill! Board the train and splash through the waterfalls of MYSTERY MOUNTAIN on your way to the TEXAS WILDLIFE PETTING PARK. Educational and fun for ALL ages, Wonder World Park Cave and Attractions is just minutes from I-35 in San Marcos between Austin and San Antonio. Gift shops, free picnic grounds, free parking and much more await your visit. This incredible adventure gives you a bird’s eye view of the surrounding mountains, meadows and canyons. The course consists of TEN separate ziplines. Each line ranges in length from 150 feet to about 900 feet for a total of about a mile of thrilling zipline fun. The ziplines are located between two hillsides stretching out above the valley at a maximum height of over 100 feet. You will feel like you’re flying as you zoom down the cable at a speed up to over 30 miles per hour. Wimberley Zipline Adventures promises to be an exciting experience that gives a big adrenaline rush. Each tour lasts approximately 1-1/2 to 2 hours. No prior experience is needed. Our highly trained guides will fit you with state of the art equipment and ease you into the course with “flight school” where everyone will practice with the equipment and learn the techniques before embarking on the tour. Wimberley Zipline Adventures is located in the pristine Texas Hill Country wilderness of the Four Winns’ Ranch. The ranch has been occupied since 1883, and the Winn family has called it home since 1937. The ranch is located off County Road1492 just south of the Village of Wimberley. Wimberley is located in the Texas Hill Country between San Antonio and Austin and is easily accessed from either of these central Texas cities. Thanks for connecting with SeaWorld on Facebook. We’re glad that you are here! The SeaWorld Facebook page is designed to be a fun community where members can engage in respectful and encouraging conversation. We expect our visitors to respect fellow members and Facebook’s posting guidelines. While we may not be able to monitor every post, please understand that SeaWorld reserves the right to remove posts and all material deemed inappropriate, at our discretion. This includes, but not limited to, abusive, threatening, offensive, hateful, derogatory, spam, fraudulent, deceptive, disruptive, and marketing/advertising messages and content. Any violation of these rules may result in being banned, at our discretion. We have three parks throughout the United States: Orlando, Florida; San Diego, California and San Antonio, Texas. Welcome to the official page of Six Flags Fiesta Texas! Home of nine world-class roller coasters and our giant FREE White Water Bay Water Park! Established in 1718 as Mission San Antonio de Valero, for over 300 years, the former mission now known as the Alamo has been a crossroads of history. Having existed under six flags of independent nations and served as a garrison for five different armies, the Alamo has a rich history and a heritage to inspire all Texans. Although the site is best known as the site of the 1836 Battle of the Alamo, all 300 years of Alamo history are vital to our story. Among the exhibits featured throughout San Antonio’s newest attraction are a wide variety of amphibians, an interactive Lorikeet and Parakeet Aviary, and a variety of cold water and tropical fish. In addition, San Antonio Aquarium features sharks, a stingray touch tank, and a rainforest with hundreds of reptiles! The San Antonio Aquarium welcomes everyone to enjoy the unique interactive experiences found within, and is especially excited to introduce children and families to the world beneath the ocean’s surface. Guests are encouraged to hand feed sharks, rays, birds, and fish, or to get up close and personal with many of the reptiles and other animals on exhibit. Above all, the San Antonio Aquarium promotes education through an interactive experience in a comfortable environment. Kids and adults alike are sure to be amazed at the soft skin of sharks and rays among other experiences. The Bandit Golf Club is situated off the shores of Lake McQueeney, an easy 30-minute drive from downtown San Antonio. Easy freeway access to Austin & Houston makes The Bandit the perfect location to enjoy an unforgettable round of golf in the Texas Hill Country. Noted architect Keith Foster sculpted 6,928 yards of golf from the longest tees, playing to a par of 71. Multiple sets of tees ensure the course is suited for players of all ages and abilities. The course winds in and around Long Creek & Lake McQueeney, creating stunningly beautiful natural water hazards. Significant elevation changes create spectacular views of the sculpted fairways, which perfectly frame the approach shots to the course’s tour-quality putting surfaces. Great course conditions are always part of the Bandit experience, and these characteristics helped contribute to The Bandit being named a “Top 10 Public Course in Texas” by Golfweek magazine. Located in the heart of historic New Braunfels, Texas, Landa Park Golf Course at Comal Springs offers convenience to our neighbors north of us, in Austin, south, to San Antonio, and everywhere in-between. Our convenient proximity to major travel-ways, such as I-35 and Texas State Highway 46, Hill Country charm and unique golf course wildlife, will leave you feeling like you’ve escaped the routine. Our facilities re-opened in October of 2014 after a complete renovation. The Landa Park Clubhouse now offers golfers and non-golfers alike, the opportunity to experience the serene environment of the place we call home. The expanded facility also boasts a venue for private events. Enjoy your experience on our 18-hole course, practice anytime on our expanded short-game practice area or opt for a lesson from one of our PGA-rated golf professionals. Ready to host an event? Let our staff enhance your experience with our tournament planning service. We can help plan your event from pairings and cart signs to scoring. Northcliffe’s beleaguered existence has set the stage for one of the best golf values in the San Antonio area. Originally designed in 1979 by Joe Finger to be the centerpiece of a housing community, the houses didn’t sell and the course fell on hard financial times. In 1992 a group bought the facility and began the long process of improvement. Those improvements have continued in recent years and the course now has an improved reputation among the golfing public. The new irrigation system, in particular, keeps the course in excellent condition. Now the fairways are plush and putts roll true. Finger’s links-style design features generous fairways and the prominent use of water, along with dry creek beds that snake through the course. The front nine is basically wide open and straight, with the exception of the bending par 5s. The back is more enjoyable with long par 3s, one of which requires a carry over water, and short par 5s that make for solid birdie opportunities. If you’re spraying it, the dry creek beds will cause problems. Another notable hole on the back is No. 14, which rides downhill along I-35.